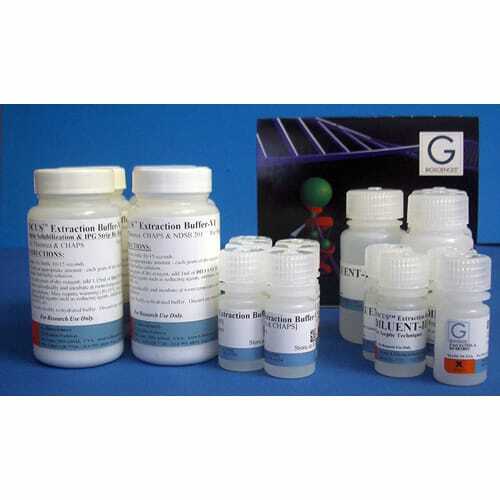 A range of lysis buffers and kits for protein extraction. 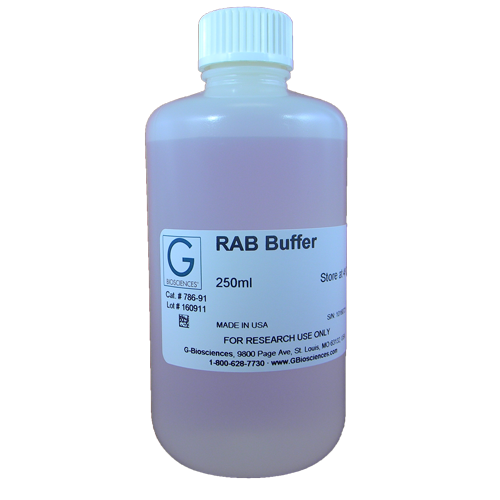 Chaotropic extraction buffers that preserve the native charge of proteins making them suitable for sample extraction for 2D gels One of the most important considerations before running 2D gel electrophoresis is the choice of protein solubilization buffers. A suitable buffer must solubilize .. The expression of recombinant proteins is a popular and routinely used technique in protein studies. 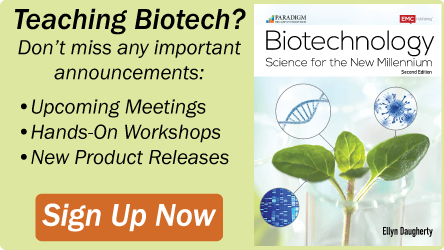 The expression of recombinant proteins often has one drawback and that is the recombinant proteins aggregate and form inclusion bodies, especially when expressed at high levels. 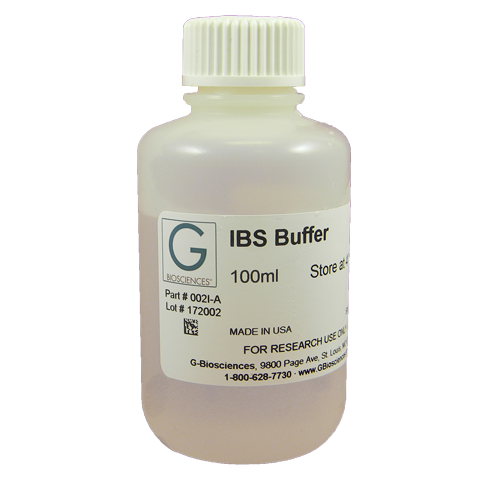 The aggre..
Bacterial PELBTM in Phosphate buffer is a variation of Bacterial PELBTM buffers only made in phosphate buffer. 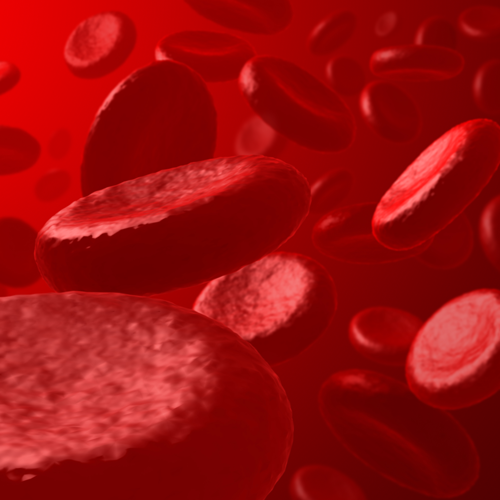 It is used preferably for extraction of soluble proteins and soluble recombinant proteins from bacterial cells. Bacterial PELBTM in Phosphate buffer contains a mild non-ionic detergent, pro..
A high salt RAB (Reassembly) buffer for the lysis of mammalian cells, including CHO1,2, COS3, NT2N4,5 and HEK29310; C. elegans6,10 and brain tissue7-9. Designed for the extraction of soluble proteins, does not extract detergent extractable insoluble proteins. 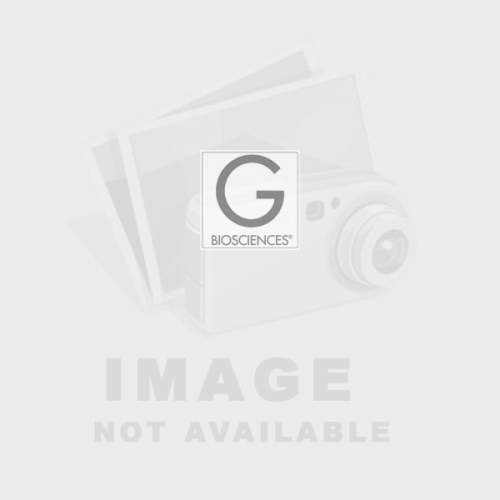 Features Compositi..
A complete lysis buffer for the release of cytoplasmic, membrane and nuclear proteins from adherent and suspension cultured mammalian cells. 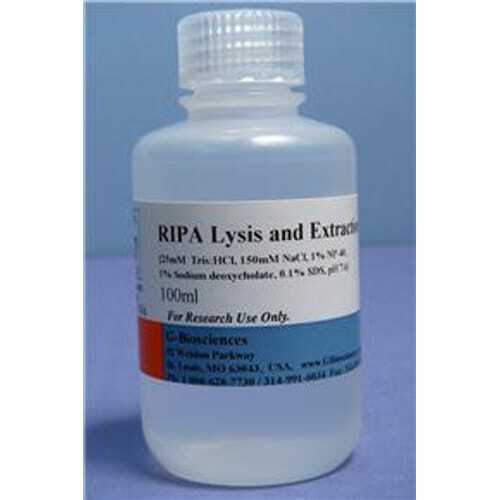 The RIPA lysis buffer is fully compatible with many applications, including reporter assays, protein assays, immunoassays and other protein purification techni.. 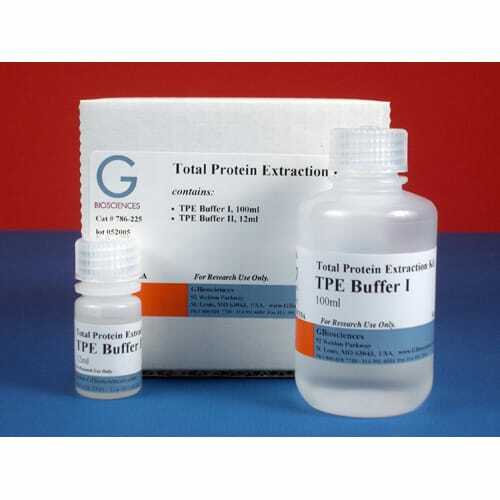 The TPE™ kit is a universal lysis system designed for the solubilization and extraction of total proteins from cells and tissues for SDS-PAGE Analysis. 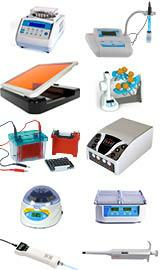 The kit is suitable for animal, plant, yeast, bacteria, and other biological samples. The TPE™ kit provides a two compo..